Lit, the super-fashionable bar with attached performance space and its subsidiary Fuse art gallery on 2nd Avenue in Manhattanâ€™s East Village is running up an amazing record. In the past year the Fuse Gallery has hosted such internationally-acclaimed artists as H.R.Giger (designer of â€œAlien”) and Winston Smith. 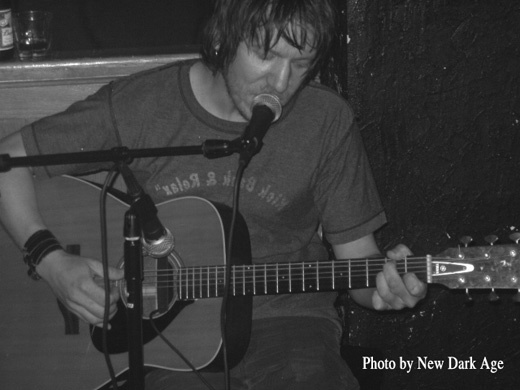 On Wednesday night, January 29, Elliott Smith, poster-boy for indie rock and famous for the sound-track of “Good Will Hunting” made a surprise appearance in the tiny performance space in Litâ€™s sub-basement. Lit, the well-stocked bar manned by affable and talented vocalist/impresario, Max Brennan and some of the most gorgeous bartenders this side of Coyote Ugly, has a few booths and tables but mostly the patrons stand around and rub elbows. It is a half-level below the sidewalk with the Fuse gallery straight back on the same level. At the bottom of a well-lit staircase is a long and narrow, subterranean performance space with bare ancient brick walls, arches and cubbyholes—very picturesque. A tiny bar (waitress service only!) far in the back is operated by breath-taking beauties of the tattooed and pierced persuasion. A crowd of adoring Elliott Smith fans, appearing to be mainly undergraduates, squeezed into this performance space with its underground ambience to see and hear their idol close-up and acoustic. Smith came out looking like he could use perhaps another round of rehabilitation. His unkempt appearance, stringy bangs and unshaven face went right along with slurred speech and the unintelligible mumblings he uttered by way of greeting the crowd. There was obviously no planned program, so Smith called for requests from the audience, but wound up mostly rejecting those requests on a variety of grounds; but he did mournfully inform the audience of “What I Used To B e” and “This Is Not My Life,” among other favorites. Despite obvious difficulty tuning his voice and/or guitar, he pleased his appreciative fans with many of his old hits and some newer efforts. Notwithstanding the apparent defects in his technique that night, he managed to impress not only his less-than-critical fans but also this somewhat jaded reporter with innovative, intelligent melodies, skilled guitar playing and depressingly authentic lyrical insights.